Imagine if you will, an RPG in the same vein as Bethesda's Fallout 3, but set in the Star Trek universe. We could have had this. 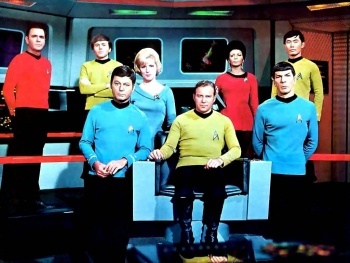 In the brief period that developer/publisher Bethesda Softworks had the rights to Star Trek, the possibility was there for the company to develop a Star Trek RPG according to in-house studio head Todd Howard. He made the revelation on a Kotaku podcast yesterday. Unfortunately, nothing was created internally and the game remained in a pitch phase. The reason it wasn't developed was due to other projects already underway, including the massive Fallout 3. Howard said Bethesda just "can't do everything," even though he wants a "big Star Trek RPG [where] you go out and explore the universe." Forget Picard, Bethesda's pitch put the Star Trek RPG back in the classic era. I guess this confirms Howard's favorite captain, though I am partial to Picard myself. After all, he never broke when that Cardassian told him there were five lights. Bethesda published multiple Star Trek games, but the in-house studio never made one of their own. It's a pity, because now that the rights have traveled elsewhere we won't see what could have been a really cool game. Bethesda's Fallout 3 proved that the company can take a classic series and properly reinvent it in the company's own image. We do have Star Trek Online coming soon from Cryptic, which by appearances seems to be doing the franchise right. I would have liked to see how "Oblivion with phasers" turned out though.